Palawan is the longest and one of the biggest provinces in the Philippines in terms of land area. This land area is gifted with beautiful tourist spots, must visit tourist attractions, amazing tourist destinations, mouth water delicacies and great people. 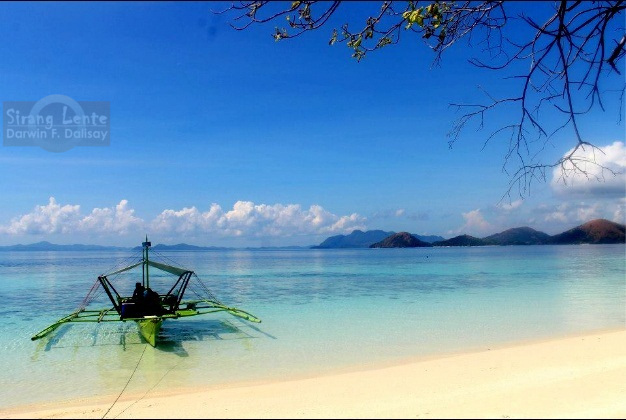 The beauty of Palawan has a combination of white beaches with calm crystal clear water, gorgeous islands (Palawan is the best island in the world), world class dive sites, caves, mountains and many more. Few of these are Puerto Princesa Subterranean river, artistic rock formations of Coron and El Nido, colorful marine lifeforms of Tubbataha reef, Mt. Mantalingajan in Rizal and the rich culture of the Taw't Batu tribes. Photo by Cheng Santos. Kayangan Lake (Photo by Cheng Santos) is one of the must visit tourist spots in Coron, Palawan. This attraction is perfect for those people aiming for adventure and picture perfect landscape. But, getting on top of the viewing deck will take 10 to 15 minutes trek but will certainly be half for fun because there's a rich diversity of floras on the trails. Upon reaching the spot for viewing, you can easily feel the tranquility in the area, see the artistic coral stone formations dipped in the calm waters that mirrors the image of the skies which added a stunning color to the landscape. Palawan has a wide forested areas can be found on the mountain ranges and these areas are rich in bio-diversity of both flora and fauna. There are vast choices of birds, land animals and insects; some of them are endemic in the Philippines. Colorful flowers on the terrain, hanging orchids on the branches, huge hard wood and fruit bearing tree are abundant on its rain-forest. This beauty can only be found in nature. Palawan Provincial Capitol is one of the landmarks in Puerto Princesa City not because it houses the most powerful individual in the province but primarily because of its excellent designs. This amazing structure is very noticeable due to its appearance and is accessible since you can find it by the highway together with other establishments such as hotels, restaurants, malls, and many more. If Manila has Bay-walk, Puerto Princesa also has its own public park by the sea. It is another spot where you can witness the last drop of the sun's golden light, together with your love ones. It has a cool sea breeze that creates an amazing ambiance, the sea water looks emerald from afar, and the mountains made the straight horizon into curvy one. Also, there are food stalls serving locals delicacies and beers to visitors. Tau't Batu or Taw't Bato is one of the newest discovered tribes in the Philippines. Their communities can be found on the high lying areas and forested mountain slopes of Mt. Mantalingajan and other nearby mountains. They are the living guards of the mountains who are engaged in hunting and agriculture for their livelihood. NGO volunteers are visiting this place to do outreach programs, spread learning and Christianity.